Full engine strip down, block chemically cleaned, rebored or rehoned as required and deck face ground to make flat as these blocks regularly sink between cylinders causing head gasket failure, mains line honed if required, block repainted. Crankshaft polished or replaced with new standard item if worn, new bearings, oil pump, water pump and gaskets throughout. New genuine Mitsubishi pistons or new genuine Mitsubishi rings if rehoned, standard con rods reconditioned, checked for straightness and fitted with ARP rod bolts. Bottom end rebuilt using genuine Mitshubishi gaskets and seals. 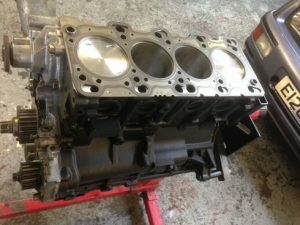 Cylinder head fully overhauled, with refaced and refurbished valves, new valve guides and seals, multi angle valve seats, lightly ported to dress valve seat inserts with ports, face diamond milled, choice of either std cams or mild uprated cams. Head refitted with Evo 8 head gasket and std head bolts, new cam belt, tensioner and idlers, new balance shaft belt. Choice of turbos on standard exhaust manifold.